Whether you have kids, grandkids, nieces, nephews, are a student yourself, a teacher, or know a teacher or student… or are human, or shop at stores you probably have noticed it is the season to stock up on crayons and pencils because they are on sale. I have 3 kids going to 3 different schools this year, so I wanted to design “back to school” cookies that could work for any age student and could be easily customizable to show your school spirit by adjusting the color combinations. This month we use lots of fun techniques on our “back to school” set and students, teachers, and humans alike will love them. Speaking of school, McGoo U looks different this month and going forward. While I LOVED having students come to the U and be a part of filming, it caused complications sound-wise and scheduling-wise to have extra people on set, so I decided to go solo. Now when you watch McGoo U it is a one-on-one lesson. Just you and me. There are several benefits to this new change to McGoo U and I hope as a McGoober you approve. The only thing I ask… now that it is just you and I… you MUST answer me and talk to your screen as you watch. Pinky swear? One other new change as we head back to school is that I won’t post a list of supplies here anymore. There IS a list of supplies, just not here in blogland. You will find the supply list on a handy dandy clickable and printable PDF. Yes, I said clickable. The PDF is chock-full of clickable links that will take you right where you can see the product I am listing. As always, you can use different colors, cutters, brands, shapes etc, but this will take you right to the things I used or something similar. Some things that will NOT change is we will still have a visiting professor join us in the Expert Lab and show us a brilliant step-by-step tutorial, a Mixing It Up, some After School shenanigans, and I’ll always use up that Extra Frosting from class. 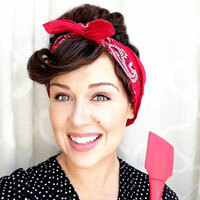 Speaking of our visiting professor, this month I had the amazing Andrea Garner of Bella Cakes. She does beautiful work on not only cookies, but cakes, and cake truffles (not to be confused with cake balls as she has shunned that term, ha ha!). She shows us how she translates her large scale gumpaste flowers to a smaller scale for gorgeous cookies that would be perfect for any occasion. I loved this tutorial because I had never used gumpaste before and I was surprised at how few supplies were needed to create stunning roses. Andrea shows us several variations and her designs are so elegant and charming! I can’t wait to play around with more gumpaste! While Andrea won’t be in the accompanying After School episode, have no fear! She will be featured in several After School episodes in the months to come. This month After School we will take a look back into my early years in “The Adventures of Young Arty McGoo”. It was really fun having my kids on set and being a part of the process. And you wouldn’t believe what we did on our day off from filming: WE DECORATED COOKIES! I hope you enjoy the changes this month as it keeps getting better. As always we have a blast putting it all together for you at Real Media in Kansas City. I can’t wait to show you what is in store in the coming months. I have made some cookie discoveries that have changed the way I decorate and I’m so excited to show you! New techniques, new tools, new recipes… all for you awesome McGoobers. Thank you so much for watching, for cookie-ying along with me, and making this possible. A special thank you to Andrea for being our visiting professor this month. I learned so much from her and we had way too much fun filming future After Schools! Have a fabulous day full of creativity… and get to class! Arty’s 12 Days After Christmas: Day 3! I am sooooooo happy to hear you are flying solo. I have to admit that I dreaded watching the episodes because it was just too awkward having the other students there, they looked like they felt awkward and there lulls in conversation and blank stares killed me. Not every one is meant for t.v but you my dear are!!! You rock the camera and most students just did not. Change can be good, keeps you on your toes and helps get those creative juices going. Best of luck!